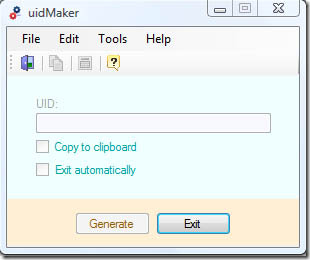 uidMaker is a UUID/GUID (Universally Unique Identifier/Globally Unique Identifier) generator, an award winning utility. It is designed to help software developers, database administrators and other IT professionals to perform one of the most common tasks, such is generating a UUID/GUID. Features include: Generated UUID/GUID is automatically copied to clipboard; Program can exit automatically after generating UUID/GUID and copying it to clipboard. Qweas is providing links to uidMaker 1.2.0 as a courtesy, and makes no representations regarding uidMaker or any other applications or any information related thereto. Any questions, complaints or claims regarding this application uidMaker 1.2.0 must be directed to the appropriate software vendor. You may click the publisher link of uidMaker on the top of this page to get more details about the vendor.